Gratitude for help with My Arthritis + Knees--AminoActiv. Today is Feb 1, 2017. I am updating this #PlantYourDreamBlog with notes of a conversation I had with Mark Faulkner, prime mover behind AminoActiv, my anti-inflammatory of choice. I have benefited immensely from this non toxic supplement. I believe it can help many more people. Among the benefits I have experienced from AminoActiv has been the capacity to avoid narcotic pain relievers. I had a lithotripsy--a kidney stone procedure-- a few years ago. After the procedure, I was able to avoid taking the narcotics. I used AminoActiv instead. it helped me manage the pain.and to avoid the narcotic side effects. More people need to know about this substitute for Ibuprofen. I discovered AnimoActiv and its earlier versions near a decade ago at the National Product Expo West, #ExpoWest. I was standing with a friend at the Lynn Gottlieb, creator of French Meadow Bakery booth, sharing thoughts about abundance, and feeling a bit of a headache. A man ran by handing out samples. It was Mark Faullkner, of Vireo Systems. He was sharing samples about a new product. He gave me some samples. I t took some. The headache went away. Years have passed. I am a person who relies primarily on the purest of whole and pure foods to stay well. I rarely use pharmaceutical drugs. If I need supplements, I use Natural Supplements. AminoActiv is the name of the blue pill that Mark gave me. I call it my Cinderella pill. There is an amazing difference in how I feel when I am taking AminoActiv, and when I am not taking it. I cannot say that AminoActiv works as well for everyone as it works for me. It may be the homeopathic ingredients that helps me, or the Amino Acid combinations that suit my particular needs. I have gotten out of some serious conditions, including groin pulls because of it. I have gotten out of shooting pains running down my legs because of AminoActiv. Once a year, I travel more than 3000 miles to help the National Heirloom Expo in Santa Rosa, CA.I travel in my 1968 VW Van called the Enchanted Garden Mobile. Every year, the journey is an uphill climb, and in recent years, the journey would have been been impossible if I had not had AminoActiv as my companion. About three weeks before my departure this year, I had a serious fall and injured my left knee. I lost all range of motion just about. I could hardly climb in the drivers seat. AminoActiv came to my rescue. On the trip, I had another fall and hurt the right knee. Same story. I could hardly get in the driver's seat. I was in shock. I took AminoActiv. I drove out of there about four days later. I was also having very strange dizzy spells, and to tell you the truth, I am really exhausted deep down. AminoActiv has an uplifting effect, not only on the arthritis that I have had since I was a teen, but it also seems to release energy that keeps me going. I am not a coffee drinker, so this is the supplement I take when I need a lift. AminoActive is personally one of the best supplements that I take. AMINOACTIV HELPS ME DRIVE 1700 MILES OR MORE FROM SAN DIEGO TO SANTA ROSA AND BACK! I met Mark Faulkner, Vireo Presdient, at the Natural Product Expo West, years ago. AminoActiv is a staple in my healing regimen. I had the opportunity to have my questions answered December 12, 2016 in a phone conversation. On my trip driving from San Diego to Santa Rosa, CA for the National Heirloom Expo, I was having hip pain. I had just fallen a few weeks prior and hurt my left knee. I was not sure I could drive. I was taking three pills every few hours, sometimes up to at least 24 pills a day. Mark told me that there are no side effects from AminoActiv. He has taken five or six pills at a time when necessary. The pills are harmless and non toxic. The bottle says, "The #1 Alternative to Ibuprofen and NSAIDs. Are their Kidney related issues with AminoActiv? Mark: AminoAcids are natural metabolites. Some Kidney tests can show signs of being elevated. We suggest if going in for kidney lab tests, to stay off AminoActiv for 24 hours before the test. Time to Take During the Day? I told Mark that AminoActiv has an amazing shift on my energy levels. I pick up energy from them. I was concerned that they might keep me up at night. He suggested taking them earlier in the day and using the AminoActiv cream in the evening. The cream was being reformulated. I do not have much experience with the cream. Why do I get such positive results? Do others get this kind of reaction? I get profound results from AminoActiv. I injured my knees about six months ago and the pain is persistent. 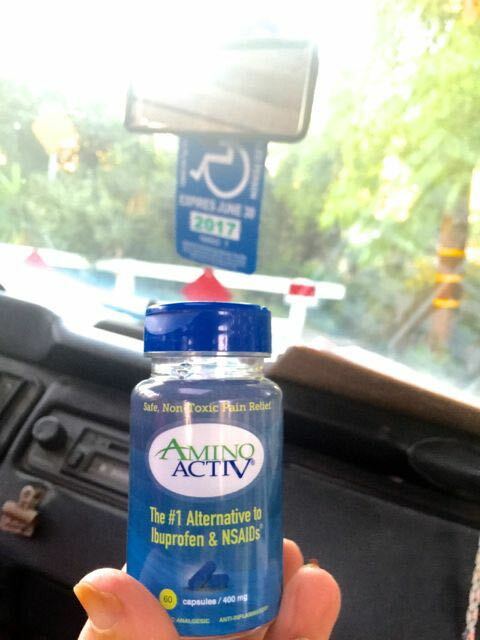 When I take Amino Activ in the morning, I am able to do my work. I also take them before Physical Therapy. I do find that during the night, I still feel pain in my knees. I have experienced the easing of cramps, as well as shooting pains that concerned me. I was not sure I could drive long distances. The pills have some homeopathic ingredients. They have what is called Alpha G.
The homeopathic ingredients were chosen because they are inflammatory suppressors. AminoActiv gives me energy. Why? opens up functional energy, not stimulate energy. at the mitoocondrial level. The mitochondria is the powerhouse of each cell. If mitochondria isn't working right, this can lead to broader dysfunction and inflammatory reactions. This can effect the brain and how we think. Mitochondrial dysfunction can lead to prostaglandin release. Mark also mentioned cell Cytokines. They are part of the body response system. All are part and parcel of mitochondria dysfunction--. 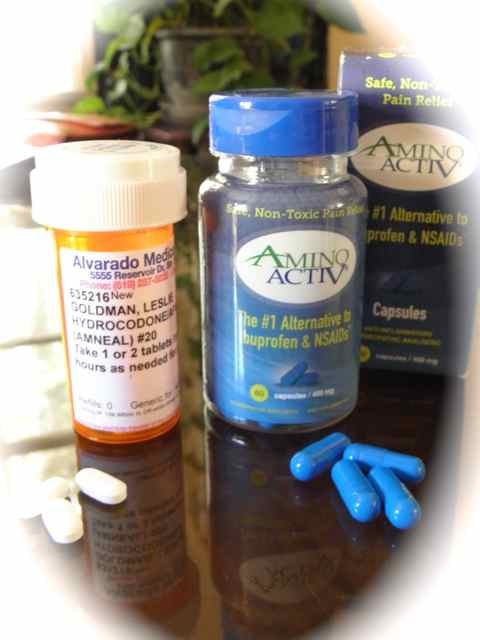 AminoActiv works to stabilize mitochondrial function. AminoActiv supports stable mitochondria. The powerhouse of the cell is working better. AminoActiv supports my the energy function. Stabilized mitochondrial helps support suppression of pain and fatigue. Many compounds are processed differently in different people. I feel AminoActiv works in about 20 minutes. Amino Acids are well known to fortify. and absorbed as natural ingredients that the body is used in processing energy. I told Mark that I seem to need more pills now. I ask why? My body is requiring more of the substances in AminoActiv. As I am aging, my body is absorbing less effectively. Will it help repair a tear in my knee? it will help to support recovery of muscle tissues. How does the mitochondria produce energy? The machinery that the mitochondria use to make energy is called the electron transport chain. Mitochondria generate chemical energy, in the form of a chemical called adenosine triphosphate or ATP for short. ATP is an energy currency that every cell in our body can use. ibuprofen will mask the pain. Prostaglandins are made by two different enzymes, cyclooxygenase-1 (COX-1) and cyclooxygenase-2 (COX-2). The prostaglandins made by the two different enzymes have slightly different effects on the body. COX-2 inhibitors are NSAIDs that selectively block the COX-2 enzyme and not the COX-1 enzyme. Blocking this enzyme impedes the production of prostaglandins by the COX-2 which is more often the cause the pain and swelling of inflammation and other painful conditions. Because they selectively block the COX-2 enzyme and not the COX-1 enzyme, these drugs are uniquely different from traditional NSAIDs which usually block both COX-1 and COX-2 enzymes. COMPANIES LARGE AND SMALL FIND NEBRASKA TO BE A HAVEN OF CALM IN A SEA OF UNREST. "The high-end, 2,000-sq.-ft. (186-sq.-m.) clean-room facility will be used to prepare products that are "natural alternatives to traditional pain management medications," says Mark Faulkner, owner and president of Vireo. "We are working with UNMC to develop products that have very defensible and provable efficacy behind them. Most popular pain relievers have toxic side effects that can cause problems with the liver, kidney and stomach. We have designed a line of pain management compounds that actually work without any of those side effects. And we have good science that proves they work." "
This talks about oxidative stress.